Whether making pot roast for this recipe or using up leftover pot roast, Spicy Pot Roast Nachos are a cheesy, filling dish great for a shared appetizer or main dish. Two types of cheese, sauce pot roast, chips and jalapenos make a satisfying recipe you’ll want on repeat. Sharing my secrets for making perfect nachos and tips for toning down the spicy for those who enjoy a more mild dish. 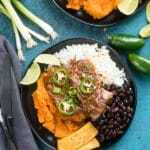 Spicy Pot Roast Nachos were created both as a means of creative leftovers use but also after a reminder that the allure of nachos is much more than throwing ingredients together when unsure what else to make. 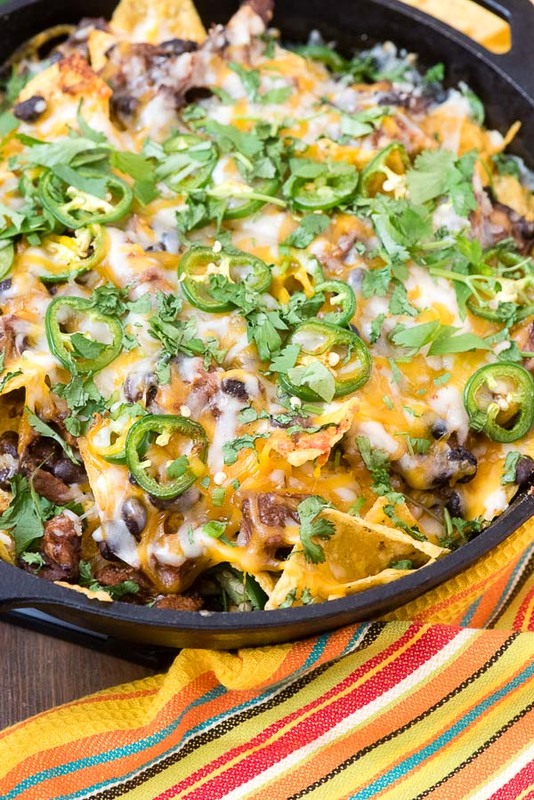 These nachos are something to put on a meal plan with a big gold star next to them! Recently my husband was traveling out of the country and to change things up I took my son out to dinner (shamelessly on a school night) to a barbeque place we love in Lyons Colorado; a small town 15 minutes north of us. They make all their own barbecue and it’s fantastic which was the draw of the idea. As a starter we ordered their nachos, which we’ve had before. Layer upon layer of chips, loads of cheese, barbecued pulled chicken, jalapenos, with sour cream and salsa to top. I tried to take a photo of it for my Instagram Stories but by the time we’d dumped all the toppings and swished them around as my son prefers it looked like a hot mess and definitely did not convey the glorious flavor. The next day I picked him up from school and we both had been thinking about those nachos. The platter of nachos had been so large we’d come home with most of our dinner order. We decided to head back out to the restaurant JUST for nachos this time. We ended up eating that for dinner and ordering a second portion to take home (my son actually likes them the following day when the chips have become soft and after rewarming in the microwave it all can be eaten with a fork). Later that week we headed out to Lyons for their Parade of Lights. 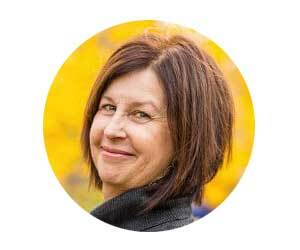 It’s a sweet, small town affair that feels very local and full of community. We’d arrived early to dine at another fun local restaurant and as we waited for it to open struck up a conversation with a couple also waiting to dine. 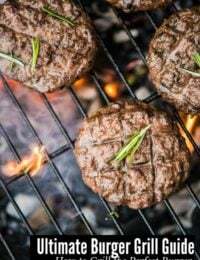 In that conversation about home cooking and easy recipes, the discussion of all the things you can do with a steak was bounced back and forth. All this to say when I’d made my recent Slow Cooker Caribbean Pot Roast with only my son and I to eat it the idea of nachos sprang to mind. Poor pot roast rarely gets much excitement even when first being cooked. It’s a sturdy dish but not one that renders many ooo’s or ahhh’s. That day is over. 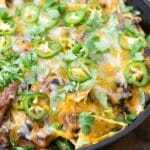 Spicy Pot Roast Nachos are simple but delicious with a kick of heat that will catch your attention. If you aren’t a spicy food lover, stay tuned for suggestions on how to tone them down. 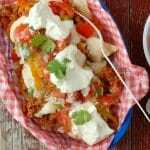 These nachos are filling and absolutely can be a main dish for a few or an appetizer to be shared. For years when I would make nachos I’d lay down the chips, add all the toppings with the cheese last and put them under the broiler. This made for a cheesy delicious top layer but diners scrambling to not end up with the naked chips on the bottom. Layer all the ingredients. Instead of putting everything on top of the chips, put layers of chips and toppings so when it cooks every bite has ‘the good stuff’. Don’t broil them, rather cook them in a high heat oven so they cook fast, but everything warms and the cheese melts all the way through. Not so into ‘spicy’? It’s easy to tone these Spicy Pot Roast Nachos down for any heat preference. 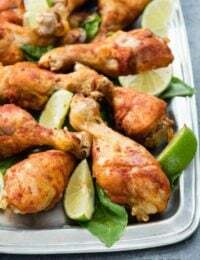 Use a mild barbecue sauce. Omit the fresh jalapeno slices and opt for pickled jalapeno slices to be added at the end by diners to control to their heat preference. And did you know dairy products are one thing that dampens spicy heat? Adding sour cream at the end as a topping will cool these off too. 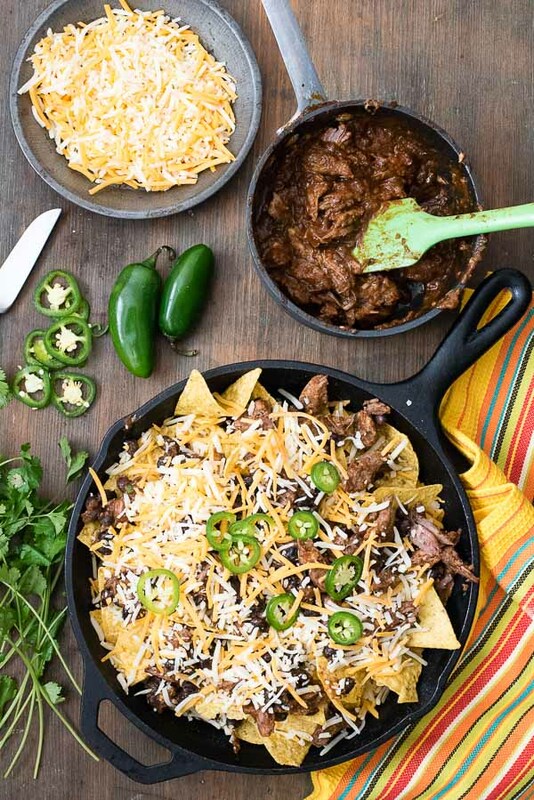 Transforming favorite comfort food Pot Roast into hearty, spicy nachos creates a whole new dish to love! 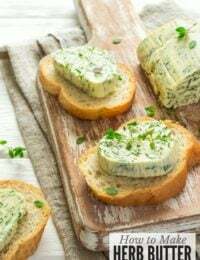 Great for a main dish or entertaining. Preheat the oven to 400 degrees. Combine the pot roast and sauce in a small bowl and stir to coat. Stir in the black beans. In a 10-inch oven-proof skillet layer half of the chips, topped wtih half of the meat/bean mixture, cheese and jalapenos. Repeat. Place in the oven for aproximately 5 minutes until the cheese is fully melted. Remove from oven. Garnish with toppings of choice: chopped cilantro, guacamole, sour cream. Serve immediately. 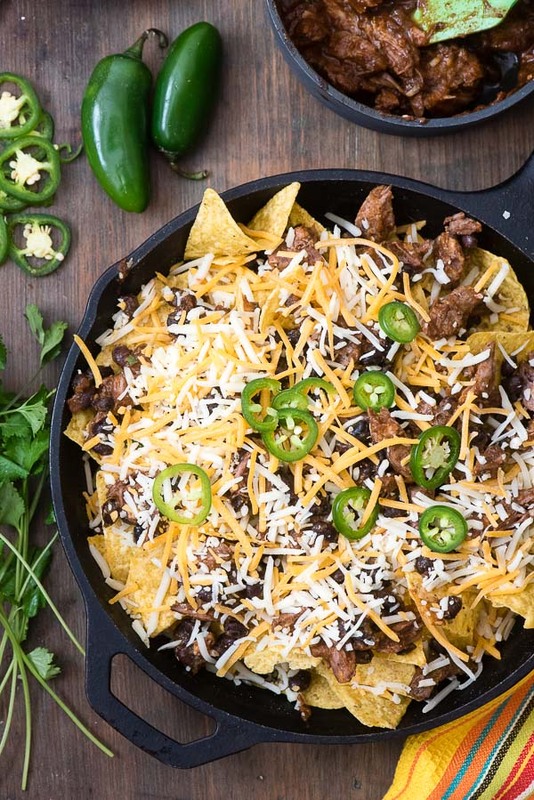 Ball Park Nachos and the Ultimate Nachos cookbook Giveaway! I love spicy food. Thanks for sharing. I will make it for my husband this weekend. Pot roast is always a winner in my house so it is unusual to have leftovers. Here’s what I will do – I will make more pot roast so I can be assured of left overs. Haha. I can’t wait to try your recipe. It looks so delicious. Spicy is the name of the game with nachos! Yum. The sound and look SO good! 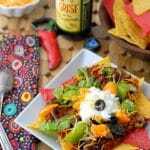 We love nachos here- so a new recipe trial is a must! This is perfect for making pot roast more exciting! 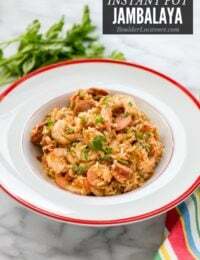 And I’m pretty sure my two boys and my husband will love this dish as well! Thanks for the awesome recipe idea! We layer ours now too. I love to serve nachos every now and again. They are always a big treat. 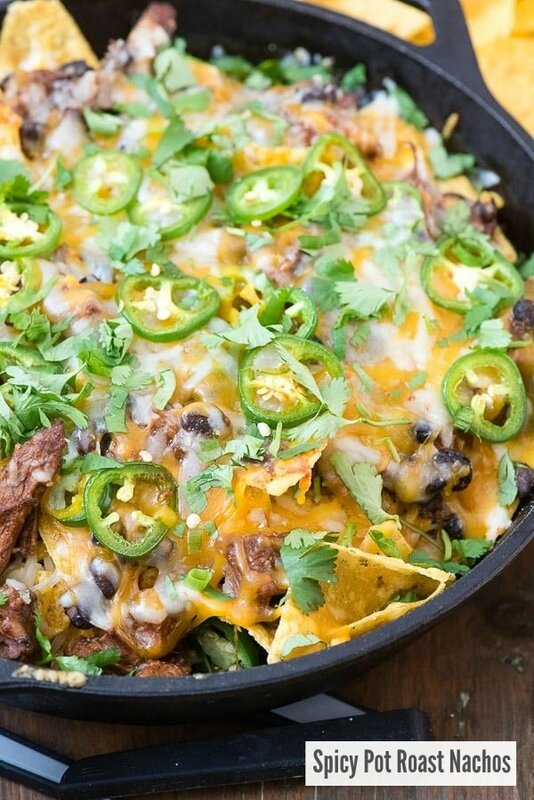 these nachos look amazing! I love nachos, it’s seriously one of my favorite things to eat. That pot roast is really unique. It also looks delish and I bet the vinegar really makes this dish. The vinegar? 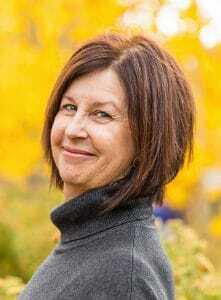 I’m sorry Janis I’m not sure what you are meaning. There is no vinegar in this recipe. YUM!! I am all about that for dinner. I have got to make this! 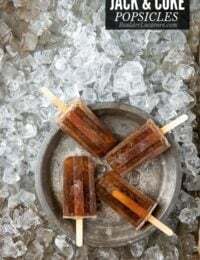 Ooh this is a super yummy idea! I have always loved loaded nachos. Yes a thousand times to this! 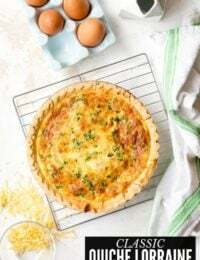 This recipe is everything to me. These nachos look absolutely delicious. I never thought of using leftover pot roast this way. My family will love this. I totally want to make this for our Super Bowl party. I love chunks of meat vs crumbled so this is perfect for me. 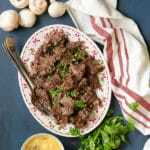 What an amazing way to use up leftover pot roast! We had something like this in Chicago once, but with poutine!